The financing of the public education system is a topic of on-going debate across the country, encompassing questions of whether spending is too high or too low; whether funding is fairly allocated among districts, schools, and students; and whether institutions make good use of the funds they receive. A common drumbeat attempts to link expectations for student achievement with the amount of funding in the system, raising issues of accountability, efficiency, and equity. The United States is among the highest spenders for education in the developed world, and total funding for public education has grown rapidly over the past 20 years, outpacing growth in both population and inflation. U.S. schools receive funding from three major sources of public education revenue — federal, state, and local government funds. Of these, state revenues comprise the largest share and are also the most sensitive to the overall economic climate. Federal funds, which comprise the smallest share of school funding, are delivered almost exclusively through formula grants targeting specific populations of students or particular programs. The largest federal formula grant is allocated under Title I of the No Child Left Behind Act (NCLB) and flows to districts based primarily on the population of low-income students served. State policy drives the allocation of the lion’s share of funding through formulas directing both state and local funds; as a result, state policy drives tremendous variability among states in terms of funding per student — with a range between the lowest funded and highest funded states exceeding $14,000 in 2012—13. Local funds, derived primarily from taxes on real property, drive much of the variability in funding levels within states and among school districts because of variation in local tax values. Frequently, state funding formulas aim to compensate for these local disparities, but inequity persists and, together with conflicts regarding the overall spending level, these conditions have historically been fodder for school finance litigation. This chapter examines trends in spending overall and at the federal, state and local levels; sources of revenue; and school finance policies, outlining both the context and functionality of school funding. Total expenditures for public education from all revenue sources in the United States as reported to the U.S. Department of Education were $606 billion for the 2012—13 school year, marking the first annual increase since the 2008—09 school year and the beginning of the Great Recession.2 The 2012—13 total expenditure equates to an average expenditure per student of $12,186 nationwide. Figure 1 shows total expenditures per student since the 1993—94 school year in nominal and inflation-adjusted dollars. In nominal dollars, total public education spending has grown 129 percent since 1993—94. Accounting for population growth, on a per student basis, education spending has doubled in the same period — reflecting an average annual growth rate of almost 4 percent. After adjusting for inflation,3 spending per student grew 27 percent in the 20-year period between 1993—94 and 2012—13 — reflecting average annual growth of 1.3 percent. In other words, growth in spending on public education has outpaced growth in both student population and inflation. Although public expenditures have grown steadily over the long term, recent years saw annual declines in spending from a high point of $610 billion in 2007—08 to a low of $602 billion in 2011—12. Total expenditures increased for the first time since the Great Recession in 2012—13, rising to $606 billion and resulting in an uptick of $8 per student nationally on average. Prior to 2008—09, total expenditures had grown each year by about 5 percent since 1993—94. Subsequent to the 2008—09 school year and the impact of the Great Recession on public revenues, spending declined by less than 1 percent annually through the 2011—12 school year. National spending data obscures tremendous variation in per student spending among states, within states, and within school districts. Often within-state disparities can dwarf the differences between states. Figure 2 presents current expenditures per student for each state for the 2012—13 school year, broken down into three major categories: instructional expenditures, support services, and non-instructional expenditures.4 The District of Columbia is the biggest spender at nearly $20,530 per student, and Utah is the lowest spender at $6,432 per student — a range of over $14,000. Figure 3 presents the same data adjusted for cost differences among states.5 This adjustment reduces the gap between the highest spending locale and the lowest spending to about $10,000, but the difference remains sizable. Variation in spending among states reflects the fact that public education is primarily a state-driven and state and locally funded enterprise. There are multiple ways to consider how schools spend their money. But through any lens, in spite of variation in funding levels among states and schools districts, what schools spend money on is remarkably consistent. Schools spend the overwhelming majority of operating funds on personnel. Nationally, expenditures on salary and benefits comprise about 80 percent of total current public education expenditures in 2010—11, down slightly from a prior 10-year average of about 83 percent. Among states, that percentage is fairly consistent. With the exception of the District of Columbia, which is anomalously low at 61 percent in 2010—11, state spending on salary and benefits exceeds 75 percent of total operating expenditures in every state. Operating funds not spent on personnel are used for things like consumable supplies (paper and office and classroom supplies) and other ongoing operating expenses (technology licenses, any contracted services, etc.). Another way of looking at school expenditures is by function—examining the proportion of total operating funds spent directly for instructional versus non-instructional purposes. Instructional expenditures include teachers’ salaries; non-instructional expenditures include spending for non-classroom related functions such as food services; and support services include administrative expenditures, student support services (such as counselors, school nurses, etc. ), and transportation services. As Figure 2 shows, the largest share of school funds is spent for direct instructional purposes, comprising about 61 percent of total current expenditures on average in 2011—12. Support services make up the next largest share — accounting for 34 percent of total expenditures on average in 2011—12; and non-instructional expenditures represent the smallest share of expenditures at 4 percent of total expenditures on average. The proportion of spending in each category nationally has been remarkably stable for the past 20 years, fluctuating by one or two percentage points at most, and this stability holds true at the state level for the most part as well. In comparing expenditure data among states, it is useful to separate current expenditures, which represent regular operating expenses, from capital outlay, which factors in costs for capital assets such as facilities and school buses. Because of fluctuation in the timing of facilities construction and the purchase of major assets, capital outlay expenditures vary significantly from year to year. In contrast, current expenditures present a more stable comparison across states and years. For context, current expenditures comprise nearly 90 percent of total expenditures on average each year. Capital outlay and interest on debt, which is excluded above and comprises only about 11 percent of total expenditures, includes spending for facilities construction and acquisition and purchases of equipment such as school buses. The largest share of capital outlay is associated with facilities construction and acquisition, comprising about 60 percent of capital expenditures in 2011—12 on average. Public schools receive revenue from local, state, and federal sources. In 2012—13, state revenues accounted for 44 percent of total revenues, local revenues represented 45 percent, and federal revenues represented 9 percent. 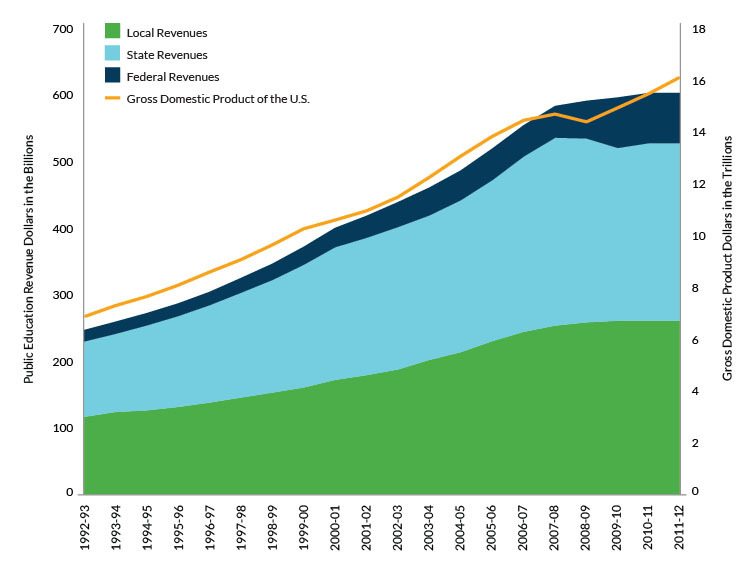 Among states, the mix of revenues by source varies and has shifted over time. The share of federal revenues varies the least. Though with a large portion of federal dollars for education targeting students living in poverty, states and districts serving higher proportions of poor students receive a higher allocation of federal funds. In contrast, the relative roles state and local revenues play in total funding for schools varies significantly among states. For example, Hawaii and Vermont both rely very heavily on state revenues, which account for more than 80 percent of total funding in each state. At the other end of the spectrum, in 13 states, local revenues make up over half of total school funding. Collectively, state pension plans face a $1.4 trillion shortfall nationally, with teacher pensions alone accounting for $500 billion in unfunded liabilities. Until recently, the federal share of public education funding remained fairly stable, hovering between 7 and 9 percent for much of the past 20 years. Then, in 2009, the federal share climbed when Congress enacted the American Recovery and Reinvestment Act (ARRA), which included nearly $80 billion in additional education spending. This influx of funds, together with declines in state and local spending during the Great Recession, drove an increase in the federal share to around 13 percent through 2011-12. In the 2013 federal budget, spending for elementary and secondary education reverted to the lowest level since 2003. As a result, the federal share has reverted back to around 9 percent of total spending on public education. Local revenues for schools are primarily derived from property taxes, while states rely on a variety of taxes, most prominently sales and income taxes. Together, sales and income tax accounted for about 88 percent of total state tax revenues in 2013. But the relative share of those sources varies widely among states. For example, nine states levy no tax or a very limited tax on income, and a few states’ unique characteristics inform their tax structures. For example, states such as Alaska and Texas derive significant revenues related to the oil and gas industry, a feature tied to those states’ particular resources. Over the past 20 years, on average, states have shifted toward less reliance on local revenue to fund schools. Often, this shift reflects policy concerns that reliance on local property taxes drives inequities in school funding because of variation in local tax values. School districts serving communities where property is worth less simply cannot generate the same level of revenue at the same tax rate as wealthier communities. Where these issues have been litigated, courts have generally asserted that the level of school funding cannot be a function of the relative property wealth of the community in which it is located. This shift has taken a couple of broad forms — reduction in reliance on local property taxes or changes in the way local property tax revenue is distributed.8 In some cases, these changes were precipitated by school finance litigation and in others, by pre-emptive legislative initiatives. For example, in the mid-1990s, Michigan and Vermont both eliminated local property tax as a school funding mechanism — Michigan as a legislative initiative and Vermont in response to a law suit. Other states have addressed these kinds of equity concerns through school finance formula adjustments to equalize revenues among school districts. These types of adjustments are discussed in more detail below. Of the three primary funding sources for public education, state funds are most sensitive to the overall economic climate, and among states, some state revenue structures are particularly sensitive. For example, states that rely heavily on one type of tax — sales tax in non-income tax states, for example — experience more volatility associated with the dominant tax. States that rely heavily on income tied to natural resource extraction experience volatility due to idiosyncrasies of those markets. In contrast, the federal government can engage in deficit spending, enacting spending bills that exceed available revenues. This ability to outspend revenues can drive a disconnect between federal spending patterns and overall economic conditions. For example, during the Great Recession, Congress responded by enacting ARRA, the federal stimulus package. This influx of ARRA funds for education expanded the federal share of funding and largely made up for the drop in state education funds to maintain a relatively stable total funding level through the recession (Figure 5). The vast majority of federal funding for education flows through formulas administered by the U.S. Department of Education, primarily under the authority of ESEA and the Individuals With Disabilities Education Act (IDEA). That said, the largest single program flowing funds to schools is the National School Breakfast, Lunch, and Healthy Snacks program, which is allocated by formulas administered by the U.S. Department of Agriculture, and totaled $15 billion for federal fiscal year (FFY) 2014. It provides no or low-cost meals to low-income students. Figure 6 shows the top five sources of federal formula funding administered by the U.S. Department of Education. Grant amounts exclude one-time supplemental funds provided under ARRA. The majority of federal formula funds administered by the U.S. Department of Education flow to states under Title I of ESEA. These funds are directed to school districts serving economically disadvantaged students to fund supplemental education services that address disparities in academic achievement. Title I provided over $14 billion to states in FFY 2015. Funding based on the population of children living below the federal poverty level (FPL) and the state expenditure per pupil. Funding includes a base allocation plus additional funding based on the population aged 3 to 21 and the population aged 3 to 21 living below FPL. Funding includes a base amount plus additional funds calculated on a per -child basis and factoring in both the total population aged 5 to 17 and the number of children living below FPL. Funding flows to eligible districts based on the population of “federally -connected” children (primarily children of military personnel). Funding is based on the prior year’s Title I allocation. Many other smaller formula grants provide funds for various purposes including teacher quality, English language acquisition, educational technology, career and technical education, and other purposes. The majority of these funds is governed under ESEA, and other than the nutrition programs mentioned above, all are administered by the U.S. Department of Education. In addition to formula allocations, at times the federal government makes discretionary awards through competitive grant processes. The most notable recent example of this practice is the Race to the Top initiative, the first cycle of which awarded $4 billion in 2010. Awards favored states that agreed to move forward with certain policies including teacher evaluations that factor in growth in student achievement, investment in state data systems, school turnaround policies, and adoption of rigorous academic standards.13 Subsequent rounds awarded an additional $1.4 billion over several years to states and districts for various purposes including those referenced above as well as funds specifically targeting early childhood education initiatives. 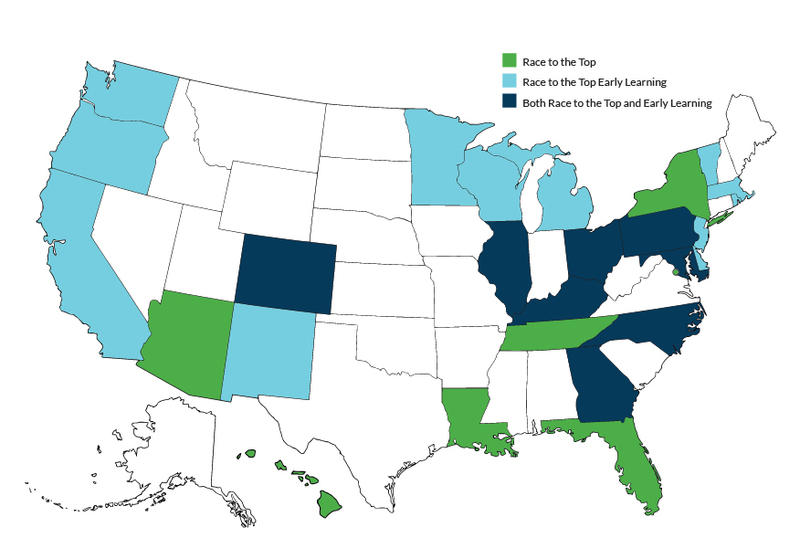 Figure 7 shows states that have received Race to the Top grants. The program ended when Congress failed to appropriate funds for its continuation in the 2015 federal spending bill.14 In some sectors, there is increased debate about whether federal funds for education are best allocated through formulas or competitive processes, with opponents of competitive grants citing a desire to reduce federal influence in favor of state and locally -driven education policies. The majority of state and local funds for schools for day -to -day operations flows through state -determined school finance formulas. School finance formulas often aim to address two issues. First, the formulas determine the amount of funding to which a school district is entitled. Second, in most states, which rely on a mix of state funds and local property tax revenue to fund schools, the formulas also make adjustments to compensate for inequity in local tax bases among school districts. Every state school finance formula system is unique—reflecting the nuances of revenue structures, student demographics, governance models, and policy preferences in state and local communities. That said, there are common overarching structures at work in most state systems. Understanding these common structures provides a useful framework for more nuanced analysis of individual state systems. States generally use two broad structures to determine how much money school districts receive: categorical and formula structures. Under categorical models, states dictate local expenditures by allocating funds for specific educational programs. For example, the state may allocate a set amount of funding to a district that must be spent for career and technical education programs, or the state could mandate that a set percentage of total funding be spent for special education or gifted and talented programs. In this way, categorical funding is somewhat analogous to federal formula grants like Title I. On the formula side, though structures vary by state, many state formulas employ “foundation grants” to allocate a large proportion of funding to districts. Under this structure, the formula allocates a set amount of funding per student to each district — a “foundation grant” that then may be adjusted based on characteristics of students in the district or characteristics of the district itself. These adjustments give more value or “weight” to compensate for higher educational cost associated with these characteristics (e.g. economic disadvantage or limited English proficiency). The weights in formulas typically account for the same kinds of cost drivers as categorical allocations. The difference is that under the foundation grant model, the state formula doesn’t necessarily dictate how schools spend those funds. In other words, while a district that serves a high proportion of students who are economically disadvantaged may “earn” more funding associated with that student population under the formula, expenditure of the funds associated with weights for economically disadvantaged students isn’t necessarily limited to programs and services just for those students. Because of this flexibility, the foundation structure is generally favored by those who favor more local control of schools. Regardless of the allocation mechanism,, state funding is allocated to school districts, not to individual schools, though some charter schools receive funding directly from the state. In addition to determining the amount of funding school districts will receive under school finance formulas, many state formulas also address the revenue sources that will fund those allocations. As discussed previously, the predominant source of local funds for schools is local property tax revenue, and variation in local tax bases can drive inequity in the amount of revenue available among school districts. To address these inequities and sometimes at the behest of the courts, many state school finance formulas allocate state revenues in a way that compensates for variation in local revenues among districts. Though the actual allocation mechanism can take a couple of different forms, the goal of these formula elements is to equalize access to school revenues among districts to some degree by compensating for differences in the local revenue capacity of a particular locale. Some mechanisms attempt to reach this goal by bringing the bottom up — districts with less local revenue receive more state funds. Others aim to establish equity by holding the top down — limiting revenue in districts at the higher end of the wealth spectrum. While these types of formula structures can create a more uniform level of funding among school districts across a state, they do not explicitly address the question of whether the overall funding level is adequate to achieve desired educational outcomes. These two concepts — funding equity and funding adequacy — have featured in court challenges to state funding systems in different ways over time (See Overview of School Finance Litigation below). Many state formulas include mechanisms intended to improve funding equity among school districts regardless of the relative wealth of the communities they serve, but none is perfect. There is debate about how best to measure funding equity and even what the standard of equity should be. Regardless, it’s clear that funding gaps among districts persist within many states. Data from the National Center for Education Statistics (NCES) supports this analysis when considering state and local funds in isolation (excluding federal funds). The 2011—12 data reported to NCES indicates that in 24 states, on average the highest-poverty districts spend less per student from state and local funding sources than the lowest-poverty districts spend. Of those, in 10 states the difference in spending levels exceeds 10 percent. State school finance policy largely determines the allocation of those funds. Because of these two factors, in the absence of a dramatic change in the balance of federal, state, and local revenues for education, any policy discussion around improving funding equity must focus on the state and local levels. But including federal funds in the measure of funding equity mitigates the differences found in analysis of state and local funds alone. Analysis of spending from all sources (federal, state, and local) in 2011—12 finds that the highest-poverty districts spent less on average per student compared to the lowest-poverty districts in only four states. This effect of including federal funds reflects the fact that the bulk of federal education dollars are allocated based largely on the income profile of the communities schools serve, primarily through federal subsidies for free and reduced price meals and under Title I of the ESEA.19 But because subsidies for school lunch programs are the largest source of federal funds flowing to schools, those concerned with equity must determine how expenditures of those non-instructional funds are considered. The differences in these analyses highlights the complexity of defining and measuring equity when comparisons based on different criteria result in very different estimates of the extent and magnitude of the problem. And while mechanisms in school finance formulas and targeted aid programs aim to mitigate funding disparities, equity among districts and schools remains a significant policy issue in many states. In addition to formula funds for basic school operations and infrastructure, many states provide funding and grants outside the formulas. The amounts and purposes of these funds vary substantially from state to state. These grants may include funds for basic resources (e.g., textbooks or transportation services), which are funded outside school finance formulas in some jurisdictions. Other grants may aim to seed fund innovative programs or practices as pilots or provide competitive grant funds to incentivize district behavior around a particular state policy priority. Ongoing public debate about whether the United States, specific states, and local communities spend too much or too little on education and whether those dollars are spent correctly can be traced through the case law history associated with various school finance law suits. In addition to fundamental discussions about the amount of public funding going toward public education, the mechanisms by which funds are allocated to schools within districts and to non-district charter schools, as well as the compatibility of funding models with innovations in instructional models, arise as current topics of finance-related debate. To date, two primary legal concepts have driven school finance litigation: equity and adequacy. Generally, equity refers to the degree to which funding is fairly distributed across school and districts (but within states). A key driver of these suits has been attempts to resolve inequities driven by reliance on local property tax revenues for school funding, which creates disparities in access to revenue among taxing jurisdictions with varying values. Courts have generally determined that location in a relatively wealthy or poor area should not dictate school funding, and remedies have included reducing dependence on local revenues for school funding, introducing formula structures to equalize revenues for lower-wealth districts through compensatory funding, and creating systems to redistribute disparate local revenues to equalize funding access. Adequacy refers to the degree to which school funding is deemed sufficient to meet the educational goals and requirements of districts and states. In other words, adequacy arguments typically focus on how much money is in the system, and equity arguments typically focus on how that money is allocated. Oftentimes, plaintiffs will seek redress on both equity and adequacy claims simultaneously. Many advocates of broad school choice options support the notion of “student-based funding” in the allocation of resources to schools by districts. The distinction between student-based funding and most current structures is that student-based funding follows the student to whatever school setting the student or the student’s family chooses in real time. This type of structure varies from current district-budgeting policies in a couple of ways. First, under current school finance formulas, states allocate funds to school districts, not to schools themselves. District budgets determine how funds are distributed among the schools, and those funding allocations are most often made based on the allocation of resources (such as teachers) and not directly on the composition of individual schools’ student populations and the particular educational needs of those students. Second, school finance entitlements are typically calculated annually based on a measure of student enrollment at a single point or over a set period of time. When a student leaves a school mid-year, funding adjustments are not automatically made. More typically, the receiving school or district absorbs the cost of that student, and that student is counted in the new school for funding purposes in future years. Opponents of the student-based funding approach cite the potential instability introduced into school district and school budgets, arguing that fluctuations within a school year would be difficult to absorb. Although charter schools are public schools, state finance structures for charter schools vary widely. In some cases, charter schools are funded through the same (or slightly modified) formulas through which traditional school districts are funded. Other states provide for a separate formula allocation for charter schools. In other cases, charter schools receive no allocation from the state but may receive allocations from the school districts their students would otherwise attend. On a national basis, public charter schools receive a fraction (about 80 percent as of 2009—10) of funding relative to traditional public schools.22 In many jurisdictions, charter schools are ineligible for specific funding streams to which traditional school districts have access, such as funding for facilities and school transportation. Funding disparities create barriers to charter school proliferation in some communities, and charter school advocates argue that these disparities are inequitable. A fuller discussion of charter school funding is found in Chapter 4: Charter Schools. Some innovative education models that dramatically alter the way in which students access school can be incompatible with state school finance systems. For example, technology can enable a teacher in one school district to educate students hailing from multiple districts within a state or across state lines through virtual or online courses. With teachers and students crossing jurisdictional lines that traditionally determine funding allocations, state and local leaders often have to create workarounds to the funding formulas to support these opportunities. Another example is personalized or competency-based learning programs, where the pace of learning is determined by individual students’ mastery and not according to a traditional “one grade per year” schedule. Because most school finance systems are predicated on attendance and these programs may shift attendance patterns, they can be at odds with the manner in which school districts generate funds. While many states and districts have adjusted for these incompatibilities, it takes time to design ad hoc funding structures that support innovation. This reality may slow implementation, and care must be taken to avoid creating perverse financial incentives that may affect uptake of new or promising practices.